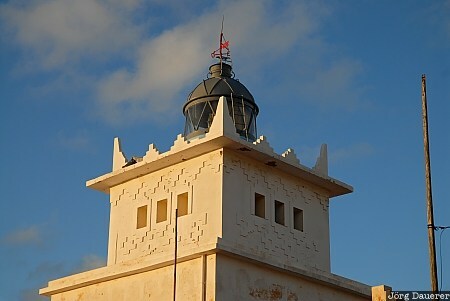 The lighthouse of Sidi Ifni illuminated by warm evening light in front of a blue sky with some clouds. Sidi Ifni is in Souss-Massa-Drâa at the Atlantic Coast of southern Morocco. This photo was taken in the evening of a sunny day in February of 2010. This photo was taken with a digital camera.